I love healthy cooking that tastes good and is quick and easy. As someone who is health conscious and a busy mom, it just makes sense. That is why I love recipes from Holly Clegg. She has seven cookbooks and has sold over 1.5 million copies! Her Too Hot in The Kitchen cookbook (affiliate link below) features 200 simple, easy recipes plus fun women’s quotes to inspire eating healthy! You’ll love her trim and terrific twist on everyday recipes. Today, I have been given permission to share a delicious stuffed salmon recipe from Holly Clegg’s Too Hot in the Kitchen cookbook. I just love these easy feta and spinach stuffed salmon fillets because they only require 5 ingredients and they taste amazing! I have recently developed a huge appreciation for salmon. It is just so good for you- filled with high-quality protein, potassium, selenium and vitamin B12, and omega-3 fatty acids. Plus, it cooks up nice and quick and is full of rich flavor. 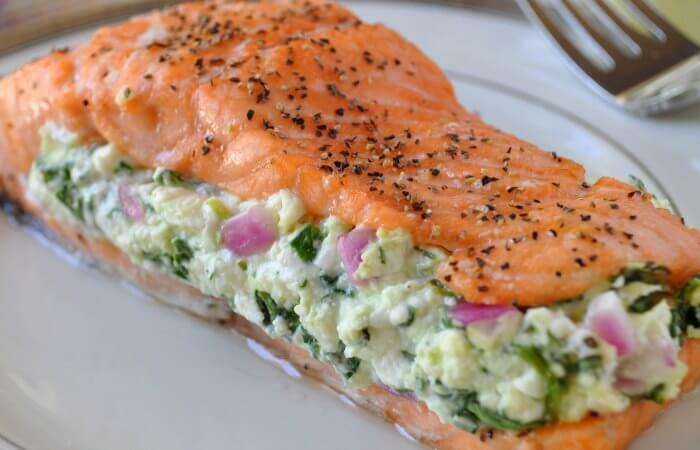 You are just going to love this stuffed salmon recipe for feta spinach stuffed salmon fillets! This magnificent dish is gourmet-on-the-go and takes minutes to prepare. 1. Preheat oven 350°F. Coat baking dish with nonstick cooking spray. 2. In bowl, combine cream cheese and feta with fork, mixing until blended. Add onion and spinach, combining well. 3. Split each piece of salmon in half lengthwise without cutting all the way through (make pocket). Divide filling in each fillet spreading to cover. Place top salmon piece back over filling and on prepared baking dish. Bake 20 minutes or until flaky and done. Nutritional Nugget: Salmon is rich in omega-3 fatty acids, having a wide variety of benefits from reducing the risk of heart disease and stroke to reducing joint pain from inflammation – and is better absorbed through food than supplements. Healthy recipe for stuffed salmon from Holly Clegg’s Too Hot In The Kitchen cookbook. Preheat oven 350°F. Coat baking dish with nonstick cooking spray. Split each piece of salmon in half lengthwise without cutting all the way through (make pocket). Divide filling in each fillet spreading to cover. Place top salmon piece back over filling and on prepared baking dish. Bake 20 minutes or until flaky and done. I recently had the pleasure of trying some amazing wild caught salmon from Sitka Salmon Shares. Wild caught salmon has so much more delicious flavor. You may want to try them too because they deliver premium, sustainable, wild Alaskan seafood from fisherman directly to your doorstep. Pretty cool! Don’t you just love have fast and easy seafood is to cook? 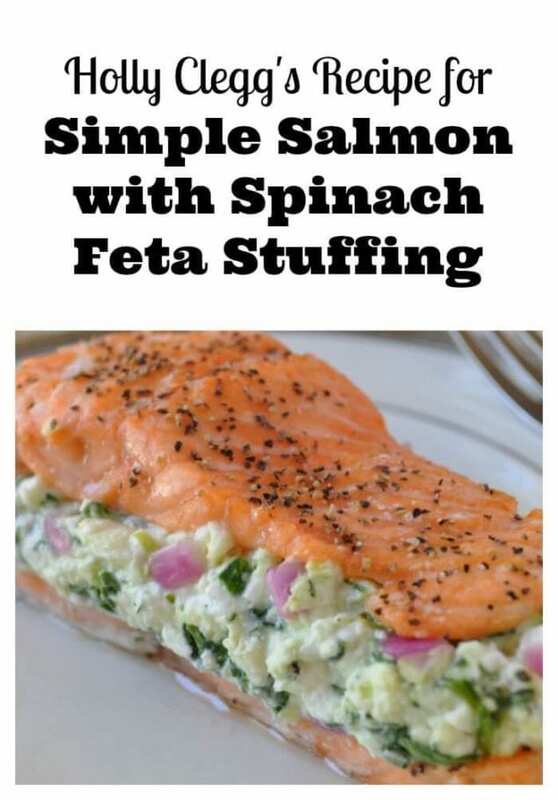 Are you looking forward to trying this recipe for spinach stuffed salmon fillets? It is such a great flavor combination and perfect for family dinners.